A house stages the living canvas on which you paint the priceless moments of your life. At Akshaya, we completely understand this. They have grown steadily and this growth attributes to the values they believe in. Quality of construction and spacious apartments with innovative technology gives their proud customers total value for their money every time. 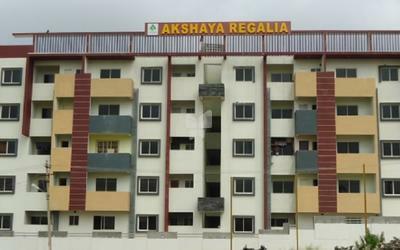 The Akshaya Regalia one of the ready to occupy project by the builder, building living spaces of 2,3 BHK Apartment in Uttarahalli. Since its inception in 2013, the group decided to rise to the next level and Akshaya Builders and Developers India Pvt Ltd with much grander plans emerged and now debuts with an articulate 170-unit Akshaya Regalia - the emblematic address of royalty - for the select few who like to live life King-size! Quality constructions, state-of-the-art facilities, affluent neighborhood, excellent facilities and personalized services spell out the quality of life that Akshaya Builder and Developers provide.